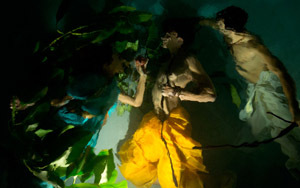 Artist Christy Lee Rogers is commissioned to create the underwater scenes of the epic Indian Love story of the "Ramayana" for Mexican born Artist and Film Director Lola Creel and her new feature film "Journey of Hanuman." Major Cinematography for the film was done by master time-lapse director and cinematographer Ron Fricke. The film is narrated by Peter Coyote and the scenes are linked by the poetry of nobel prize poet Octavio Paz, translated by American writer Eliot Weinberger. Other collaborators include the Kronos Quartet and Krishna Mohan Bhatt. A first screening will take place at the George Lucas Skywalker Ranch on Jan 16, 2013.